Auf dem Museumsvorplatz sind kontrastreiche, glatte Wege zum Eingang eingebaut worden. Auf der rechten Seite des Museumsvorplatzes befinden sich drei Behindertenparkplätze. Die Türen des Museums öffnen sich bei Annäherung. Blick auf die Museumskasse, die zum Teil unterfahrbar ist. Der kleine Aufzug fährt in das Untergeschoss, wo sich Schließfächer, Toiletten und der Vortragssaal befinden. Die Schließfächer sind auf unterschiedlichen Höhen angebracht. Sie brauchen ein 1-Euro-Stück. Im unteren Foyer befindet sich eine rollstuhlgerechte Toilette, außerdem im Restaurant und im Museum. Die Glastür zum Museum öffnet sich bei Annäherung. Das Bedienfeld des Aufzugs ist taktil gestaltet, die Stockwerke werden angesagt. Die Terrasse des Restaurants DelikArt ist stufenlos begehbar. Das Restaurant DelikArt ist stufenlos begehbar. For many years now, the Rhineland Regional Council (LVR) has pursued the goal of integrating persons with disabilities into society. LVR regards it as its task to make possible a, for the most part, self-determined, active life for this group of the population. 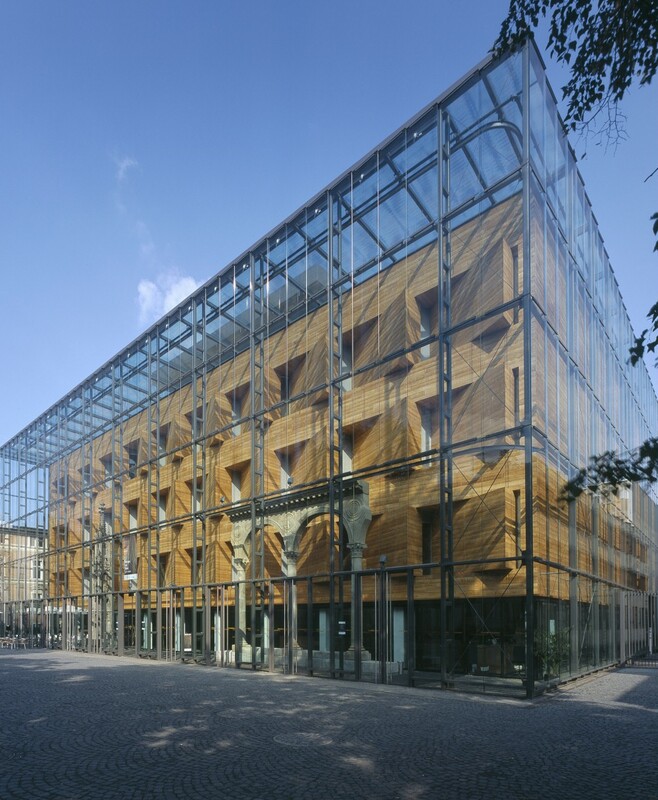 As sponsor of the LVR-LandesMuseum Bonn, when the architectural renovation work was being done, the Rhineland Regional Council made sure that accessing the building would be as barrier-free as possible. 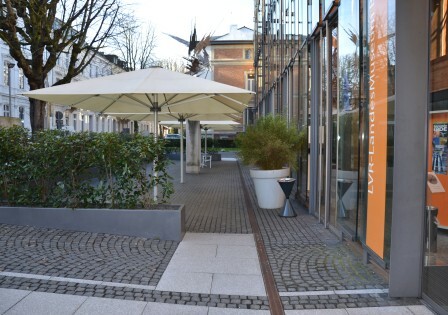 In order to make it easier for persons with disabilities to access the collection and the exhibitions, the LVR-LandesMuseum Bonn has developed special offers, which may be tailored to suit the individual needs for various types and ranges of disability. For the deaf and the hearing impaired there are multimedia-guides at the museum for tours in German sign language explaining the most important pieces on display in all thematic areas and from all epochs of the permanent exhibition. To assist you there is a museum map listing all of the information points in the museum. On site, the selected exhibition objects are labeled with a sign language symbol. The loan of the equipment is free of cost to persons with hearing impairments. Among the special offers for persons with disabilities, we have both tours (also touch tours) for the blind and for visually impaired visitors as well as tours for deaf persons and persons with hearing impairments. Interpreters translate these tours into German sign language. Of course, you may also book individual tours with sign language translations on the dates you desire during our opening hours. We will organize a sign language interpreter for you. These tours last approximately 90 minutes and cost the normal, or respectively reduced, entrance fee for the severely disabled, with an added 45 Euros for persons accompanying these guests. Fees for the sign language interpreter are borne by the LVR. Please reserve at least four weeks in advance with kulturinfo Rheinland. The museum is only a few minutes' walk from Bonn Central Train Station, or the Central Bus Station. The city's traffic guidance system also has signs directing motorists to the museum. 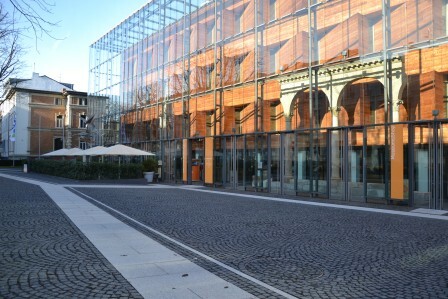 In front of the museum building, directly on the right-hand side of the forecourt, there are three handicapped parking spots. All doors open automatically upon approach. Inside the museum there are two elevators providing visitors with access to the upper floors. 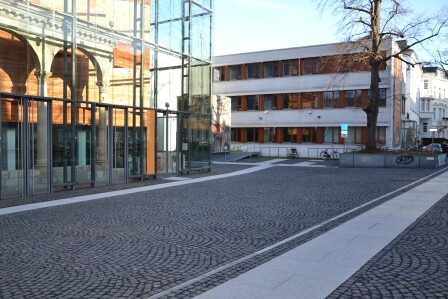 The entrance to the public library is located on the left side of the museum in the Sculpturenhof Sculpture Courtyard. It is accessible without steps. We loan wheelchairs free of charge to those who have trouble walking. A group of persons limited in their mobility and their escorts visit the exhibition "War and Peace. Celts - Romans - Germanic Tribes." They are located in the room with statues of Roman goddesses, listening to explanations provided by the pedagogic assistant. A group of persons limited in their mobility and their escorts visit the exhibition "War and Peace. Celts - Romans - Germanic Tribes". Handicapped-accessible toilet facilities are located in the basement foyer and in the museum on the first and second floors. There are also toilet facilities in the upper foyer near the museum Restaurant "DelikArt", which are handicapped-accessible. The lecture hall on the basement level of the museum may be accessed via an elevator. However, the elevator cabin is less than 139 cm deep, with a door width of 89 cm, posing a limit for wheelchair accessibility. The lecture hall itself has three spaces that are specially reserved for wheelchairs. This space may be extended in special cases and for groups who have reserved in advance. 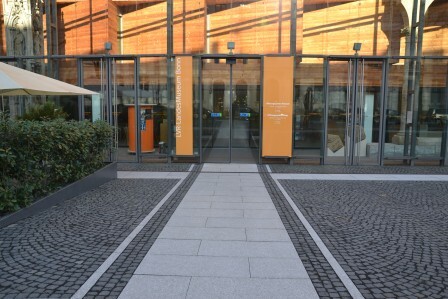 There is barrier-free access to the Museum Shop und Restaurant "DelikArt". The admission fee for persons with disabilities in possession of an appropriate identification card is 6 Euros. Accompanying persons who are listed on the identification card have free admission. To institutions for senior citizens and their residents we can offer a wonderful time at the museum, which might even be able to stir up a memory or two. You come with your group of up to eight residents with dementia and three competent accompanying persons. We will already be here to greet you at the door and usher you to a table we have reserved for you at our Delikart restaurant where we will first drink a cup of coffee or tea together (self-service). In this way you can get to know the museum guide in a relaxed atmosphere. Then you will all take the elevator to the exhibition where your very relaxed tour will begin. In all, you will be spending about 90 minutes at the museum. A parking space for your vehicle is available at the museum, just a few steps from the entrance. Likewise, we will have two wheelchairs available on location for you to use. As a model project, the senior citizens afternoon for persons with dementia costs 80 Euros in all (including admission fees, the guide and coffee). Please let us know the date you would like to come, and reserve at our service number 02234 - 9921555 (kulturinfo Rheinland).